Knowing who your competitors are is pointless unless you do something with that information. Learn how to build your own competitive analysis matrix that organizes your collected information into useful, usable data. In this article, Amanda Short elaborates how you can start improving your mobile app today. With such fierce competition, it is important to make your app the best it can be. One of the most productive ways to do this is by conducting a competitive analysis to see where your competitors are at, what is working for them, what isn’t and what you can do better. Why should customers choose you? A competitive analysis should be conducted in various stages of an app’s life, the first being when the app is still in the idea stage. In this stage, you’ll need to identify whether there is even a market for your idea and, if so, what that market looks like. The second stage is a periodic revisit. Competitors can easily enter and exit in today’s market. Staying up to date on what that market looks like is important. The third one is before you make any major changes to your app or business model’s structure. And if you entered the market without ever conducting one, please stop and do one now! Even if you are doing well, it is important to know where you stand. This article will focus on the process we use for periodic revisits at Kdan Mobile. It has helped us get over 100 million worldwide users. Adjusted to your individual needs and added to your strategic plan, it can do the same for you. Identifying your competitors is the first step in any good competitive analysis. While, there are many ways to identify competitors, what is most effective for you will depend on your focus. We use many methods to identify competitors, but I will share with you the three most effective ways we have found to identify competitors, focusing on identifying those that receive a lot of traffic or attention. To find competitors using keyword research, you’ll first need a list of keywords that describe your product’s main features and the scenarios in which users might use this product. Take our PDF Reader. We have the keywords “PDF editor,” “annotate,” “scan,” “highlight,” “sign,” etc. Keyword research tools such as AppTweak and Sensor Tower are good resources and can be very useful in this step. They will suggest competitors as well as keywords. 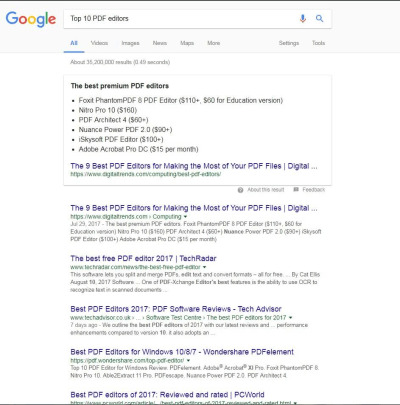 Depending on the tool you use, you might also see the traffic that the words or phrases receive, how competitive the words are, whether your suggested competitors are paying to rank for those words and more. From this, you will be able to identify a list of competitors, which can later be broken down into direct or indirect competitors. A simple yet important way to identify competitors is to read and follow the news in your app’s market. For our apps, we follow tech news websites such as TechCrunch and The Verge. Competitors identified through these outlets should be of high interest to you. These outlets have high traffic, which means a lot of exposure for your competitors. You’ll want to know how they gained this media's attention and how you can earn this limelight as well. I recommend subscribing to their newsletters to keep track of the latest developments and product news. These media outlets often provide more detailed information about both the company and their product(s), further helping you to identify why they were featured. Word of mouth is still the best form of marketing today. Pay attention to what people are talking about, good and bad. Sometimes customers will mention competitors in their app store reviews and in emails to customer service, comparing the different products they have tried. Pay particularly close attention to the competitors that are named here repeatedly. These are the ones that are reaching the same audience as you. You’ll need to figure out how to direct the attention that this audience is giving to your competitors’ products to your own. Remember that competitors can and do change. This is not a one-time job. Knowing who your competitors are is pointless unless you do something with that information. 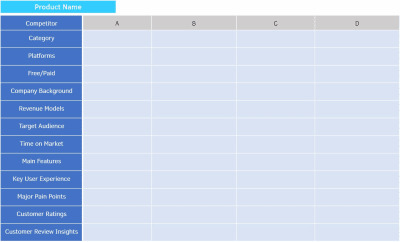 A competitive analysis matrix organizes your collected information into useful, usable data. You can keep track of many things in your matrix and organize it in many ways. I'll share with you some of the key data we collect and the ways we organize our matrices. The first few things we include in our matrix are basic information about the app and the company that provides it. Knowing how similar their strategy, structure and focus are to yours can help you identify how likely the things they have done will give you the same results. Getting discovered in an app store is no easy task. Little things, such as the category an app is placed in, can limit the exposure of the app. Don’t overlook the importance of collecting and analyzing this little piece of information. People want to be able to use their favorite software on all of their devices, regardless of the operating system. To meet this demand and to stay competitive, developers have started offering their products on multiple platforms. Note which platforms your competitors’ apps are offered on and the extent to which all features are available on those platforms. Many apps are offered on multiple platforms, yet the quality and features offered vary. The cost of an app has a major influence on one’s willingness to download it. Comparing the cost of your competitors’ apps to their overall performance can help you decide how to price your app for success. The background of an app’s provider will affect the design and strategy of that app. You can learn something from all of them, but the background affects the value and ways you can use the information collected about the app. For example, apps with similar backgrounds will provide the most accurate information about the potential outcomes of certain actions you might take. Target audience is an important comparison factor to consider when analyzing your matrix. You can use this to get ideas of what has and hasn’t worked for your audience, to discover new audiences you might want to reach and ways to reach them, as well to get new ideas from different audiences to try on your current audience. Are you looking to grow your app fast, or do you have a “slow and steady wins the race” approach? You can compare a company's time on the market with their growth performance to identify competitors’ actions that align with your strategy. One of the first things to include in your matrix is the main features of your competitors’ products. Read their app descriptions and try the products yourself to see what pops out as a main feature. UX is very important. Try out your competitors’ apps, and leave some comments in the matrix. Focus on how easy it is to use and to find the features you are interested in and on how logically it flows. We do this with all of our competitors’ products. The more people in the company you can get to try out the apps and to contribute, the more accurate and well-rounded a view you will get. From the user experience research, you will notice that some things aren’t optimal. Note where these products could use improvement and how they might be improved. Customer ratings are a good overall view of how customers regard an app, despite all other factors. App store reviews are a treasure trove of information about a company's product, such as what people like about the app, what they dislike, what features they wish it had, what features need improvement, etc. We first keep track of a competitor's overall rating and then read their reviews to identify common threads. We highlight the reviews in our matrix in different colors to identify the different kinds of reviews and how we can use them. For example, we highlight all reviews that talk about an app’s user interface in green. 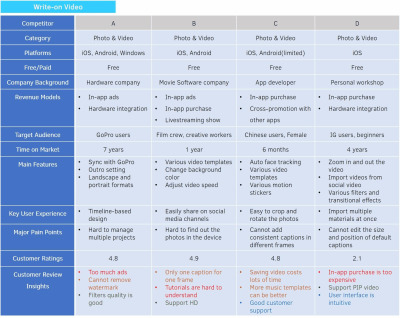 Here is an example matrix for our Write-on Video app. The ultimate goal is to create something that gives you a competitive advantage. If used properly, your competitive analysis matrix can help you do this. What good is all of this knowledge if you don’t do anything with it? After completing your matrix, analyze it to better understand what your competitors are doing, where you stand in the market and how you can improve. If you are a visual learner, it might help to put the data collected into graphs and charts to help you identify patterns and outliers. For example, a radar chart could help you compare multiple quantitative variables. Think of the matrix as your personal fortune teller. It provides a wealth of knowledge that can help you predict the success of certain actions. For example, from the “Customer Reviews Insights” section of our Write-on Video matrix, we knew that if we added a lot of advertising, we would likely get a lot of negative reviews and lower ratings. We also learned that user interface design and customers’ knowledge of how to use the product are key to their satisfaction and high ratings. So, we choose to keep Write-on Video ad-free, and we try to optimize the user interface and to insert tutorial videos in the app. From the “Main Features” section of our matrix, we can also analyze the features offered by our competitors to see which are relevant or required for us to stay competitive. Are the features offered for amusement or for pros, or are they essential features one needs to get the job done. You wouldn’t have a drawing app without an eraser. From our Write-on Video matrix, we can tell that video templates and special effects such as filters are common features of video-editing apps and, therefore, are a basic requirement to include if we want to even think about competing. 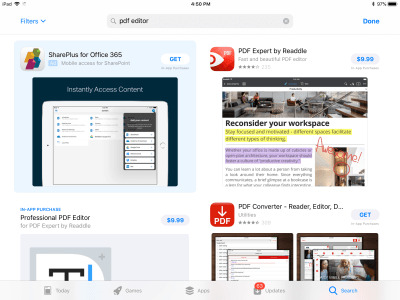 Another example is NoteLedge’s drag-and-drop feature. From our NoteLedge competitive analysis, we found that users value the ease and convenience of dragging and dropping. So, we upgraded the feature a bit to allow users to drag and drop videos into their note and to play them directly from the app. We released it in our most recent update of the app, and users love it. Performing a competitive analysis is key to improving your app. It can give you insights into the best revenue and pricing strategy, the most effective medium of communication with certain audiences, the minimum features required to stay competitive, ways to differentiate yourself and more. After completing all of this, you should have a pretty good idea of where you stand and where you want to be. Summarize the findings of the matrix so that everyone can get a quick understanding of where you stand in the market. Set goals, develop a plan of action to get there, and get started. Now it’s your turn to act. Start improving your mobile app today.